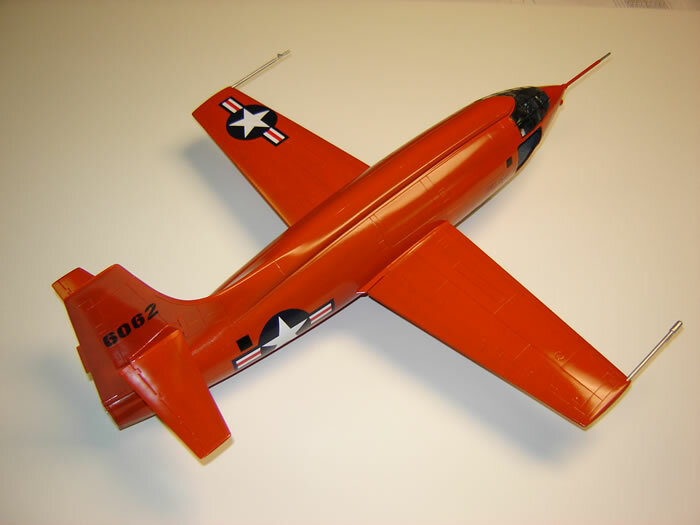 This is the 1:18 scale Bell X-1 model kit from Pegasus. The kit was designed to be a “push together” type of construction were glue is not required. I suggest that glue be utilized in the construction. The landing gear design allows you to display both deployed and retracted positions. 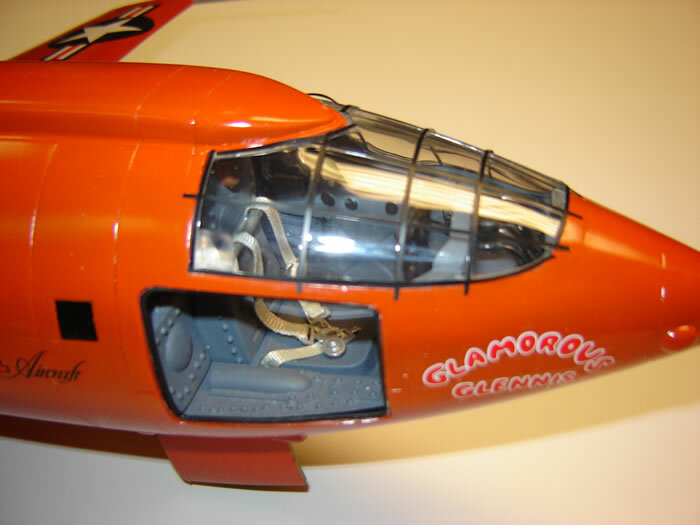 The clear canopy is molded in one piece, and is crystal clear. I used thin strips of press-on tape for the canopy exterior metal strips. The cockpit access door is molded into the fuselage. I cut it out and added the pressurizing weather strip for detail, and so the cockpit interior could be seen easier. The kit has recessed panel lines. The lines do not match up to well when the fuselage halves are joined. The instrument panel has a decal for the instruments on the front, but has instrument housings on the back. That could be an improvement in future issues by adding photo-etch and clear or molding the instrument faces into the panel. The yoke does not come with the “T” handles. They will need to be added. I fabricated rudder peddles because the kit did not contain any. I added instrument wiring and cabling to the rear of the instruments because they can be seen thru the canopy. A set of seat belts and shoulder restraints will need to be added. I added several access panels to the floor of the cockpit. It would not take a lot of work to cut loose the control surfaces and flaps so they could be positioned, even though you never see a photo of the X-1 with any control surfaces out of the neutral position. Although there are not a lot of pieces to this kit, care will need to be taken in assembling the main gear. The down lock mechanism can be assembled incorrectly. The diameters of the three probes are a bit on the heavy side, but do not detract from the overall proportions of the model. The decals are clear, with crisp lines, and a breeze to put on. The tires really need to have the tread as on the real X-1. The tires you get with the kit are smooth. 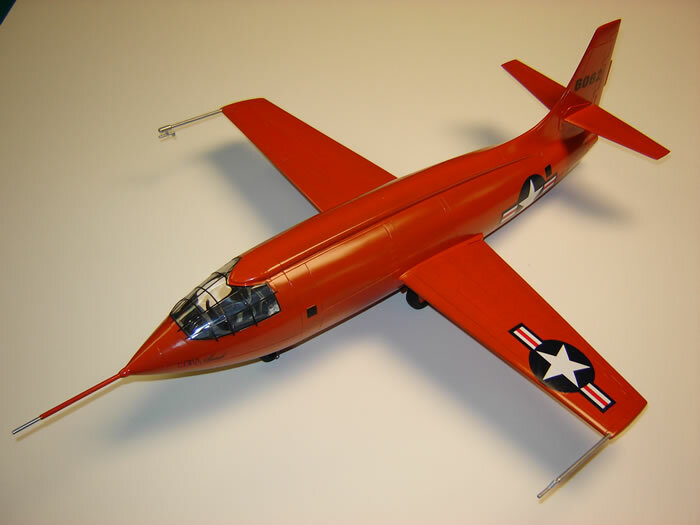 This kit is modeled after the first X-1 that broke the sound barrier. I did not measure the wing to determine if it was close to the 8% wing that was flown on the first X-1 (as if I could tell). All in all this is a wonderful and long awaited addition to my 1:18 scale collection. I would recommend this kit to anyone who enjoys large scale planes.